I am a senior researcher at Preferred Networks Inc., Japan, in the area of human-computer interaction (HCI). 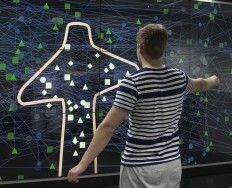 My main research interests are in interactive surfaces and pen computing, embodied and remote interaction with large displays and more recently in combining HCI with deep learning or "AI" (AI for HCI and HCI for AI). I have done research both in industry and academia in several countries, including Canada (University of Waterloo), Germany (Technische Universität Dresden), the US (Microsoft Research, Redmond), Switzerland (ETH Zurich) and Japan (Ricoh and Preferred Networks, Tokyo). Prior to that I worked as a freelance developer in various startups in Germany during the first dot-com period. 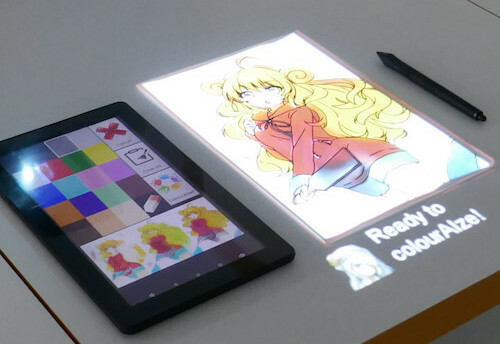 ColourAIze is an interactive system that analyses black and white drawings on paper, automatically determines realistic colour fills using AI and projects those colours onto the paper within the line art. In addition to selecting between multiple colouring styles, the user can specify local colour preferences to the AI via simple stylus strokes in desired areas of the drawing. 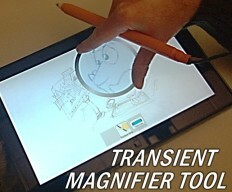 This allows users to immediately and directly view potential colour fills for paper sketches or published black and white artwork such as comics. 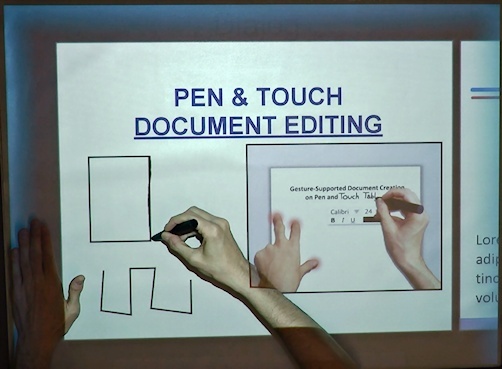 This work investigates the use of different pen-holding grips while writing and drawing on a tablet to trigger various actions, including changing the pen function (e.g. to select, scroll, search) and calling in-place menus. The postures are recognised when the hand contacts the surface using a deep convolutional neural network applied on the raw touch input data (the capactitive image of the tablet). The feasibility of this approach is confirmed by two user evaluations. Multiray is a concept that extends single raycasting for interacting with distant vertical displays to multi-finger raycasting, that is, each finger projects a ray onto the remote display. In particular, with multirays, patterns of ray intersections created by hand postures can form 2D geometric shapes to trigger actions and perform direct manipulations that go beyond single-point selections. 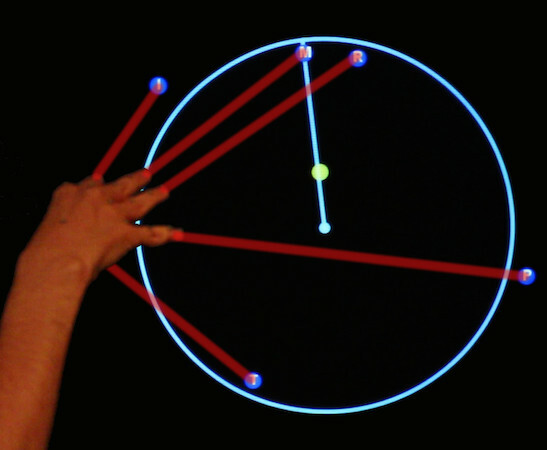 This project looks at the performance of switching between different functions or modes for touch input (the possibility to rapidly change the output produced by the same touch action). 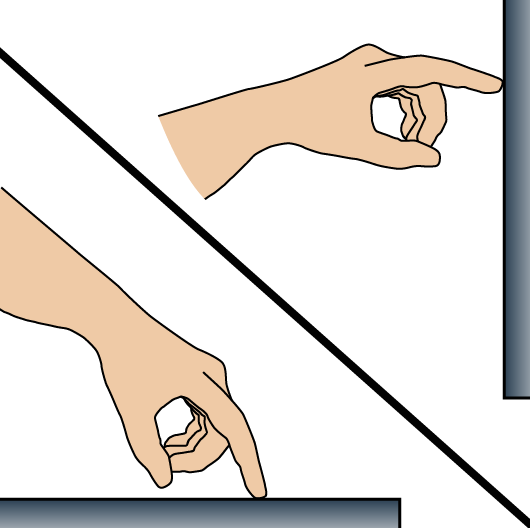 Six techniques are evaluated in sitting and standing conditions: long press, non-dominant hand, two-fingers, hard press, knuckle, and thumb-on-finger. Our work addresses the lack of empirical evidence on the efficiency of touch mode-switching techniques and provides guidance to practitioners and researchers when designing new mode-switching methods. Tabletop interaction can be enriched by considering whole hands as input instead of only fingertips. In this work, we propose a straightforward, easily reproducible computer vision algorithm to recognise hand contact shapes from the raw touch contact image. The technique is able to discard resting arms and supports dynamic properties such as finger movement and hover. The algorithm is used to trigger, parameterise, and dynamically control menu and tool widgets. This project is about enhancing live multimedia presentations by integrating presenters in their presentation content as interactive avatars. 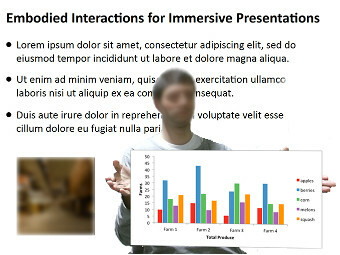 Using multimodal input, especially body gestures, presenters control those embedded avatars through which they can interact with the virtual presentation environment in a fine-grained fashion, i.e. 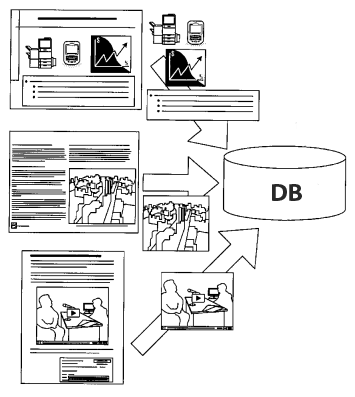 they are able to manipulate individual presentation elements and data as virtual props. The goal of this endeavour is to create novel immersive presentational experiences for live stage performances (talks, lectures etc.) as well as for remote conferencing in more confined areas such as offices and meeting rooms. In this work, we revisit the concept of ubuiquitous projection, where instead of considering every physical surface and object as a display, we seek to determine areas that are suitable for the projection and interaction with digital information. We achieve this using mobile projector-cameras units (procams) and a computer vision technique to automatically detect rectangular surface regions with properties that are desirable for projection (uniform, pale, non-reflective, planar etc.). In a next step, we explore body-based interactions to adaptively lay out content in those recognised areas. Magic lenses are popular tools to provide locally altered views of visual data. In this work, we introduce the concept of BodyLenses, special kinds of magic lenses for wall displays that are mainly controlled by body interactions. Using body position, arm gestures, distance to the display and classic multitouch on the screen, we show how parameters such as lens position, shape, function and tool selection can be dynamically and intuitively modified by users. With the proliferation of large horizontal and vertical displays in people's work environments and public spaces, creating interactions that are adapted to the size and orientation of those screens becomes increasingly important. The goal of this project is to identify the size and orientation-dependent factors that may -or should- influence the design of interactions and interfaces on large interactive displays. Furthermore, we seek to determine how far typical interaction models and UI designs can be transferred from horizontal to vertical surfaces and vice versa. Using a special grip- and motion-sensitive stylus and a grip-sensitive tablet, we explore a range of novel pen and touch interactions including detecting how the user holds the pen and the tablet, distinguishing between the pen-holding hand and the bare hand, discarding touches caused by resting palms while writing (palm rejection) and a number of contextual gestures resulting from the detection of those different postures. 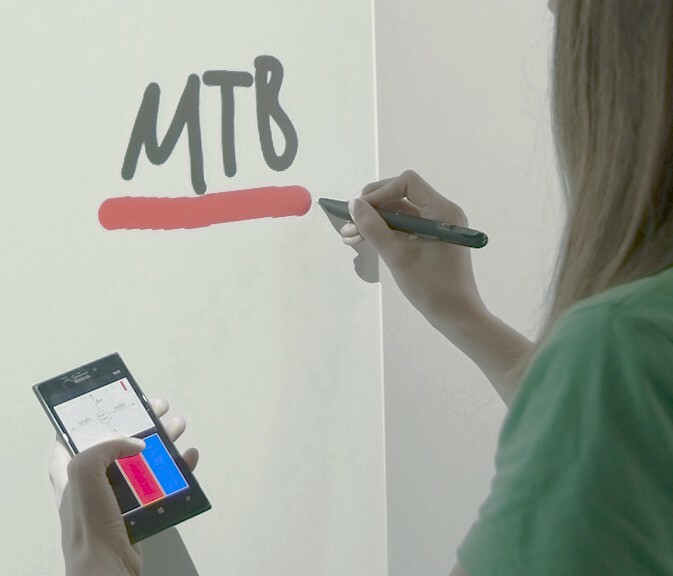 In this project, we investigate how smartphones can be used as portable quick-access toolboxes held by the non-dominant hand to provide assistive touch commands for pen-driven whiteboard tasks. In particular, we consider an eyes-free UI design, which allows users to operate the handheld device in a blind manner, i.e. 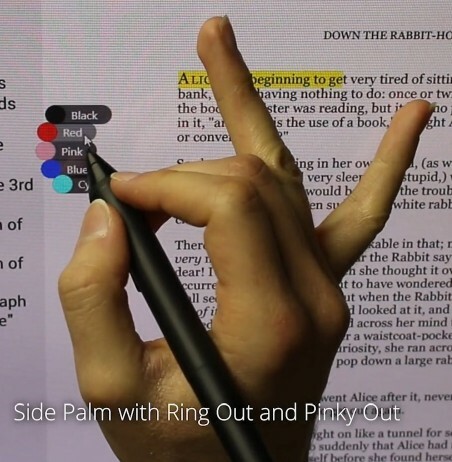 without having to look at it, thereby allowing them to concentrate on the pen task. In this work, we present and evaluate a set of pen-based techniques to annotate maps on tablets or interactive tabletops and selectively convert those annotations into spatial queries allowing users to search for points of interests within explicitly or implicitly specified scopes, e.g. look for restaurants, hotels etc. 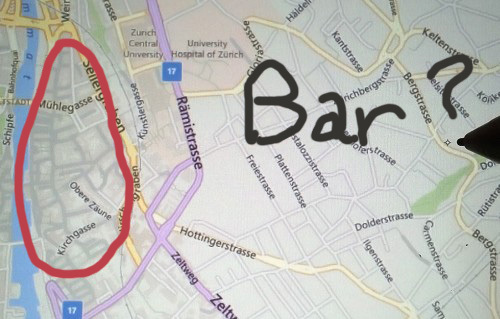 within circled areas or along sketched paths or calculated routes. 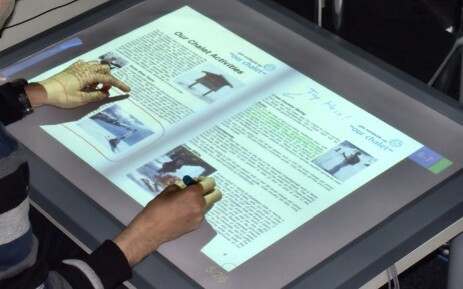 Digital tabletops operated using hybrid pen and touch input provide rich interaction possibilities. 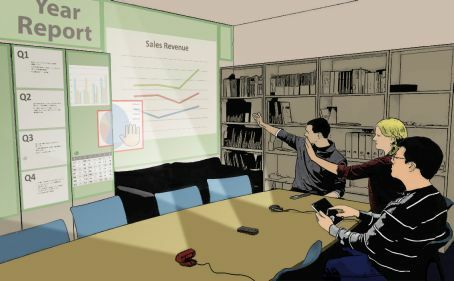 As interactive workdesks within the office of the future, they stand to support knowledge workers in a number of productivity tasks, many of which are likely to involve documents. This project aims to leverage the potential of those systems to support document-centric activities, especially the editing and authoring of documents. In particular, the practicality of post-WIMP designs based on bimanual gestures is explored. 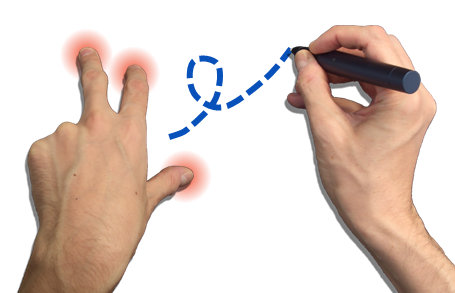 Combined bimanual pen and touch input is a relatively new interaction paradigm with promising prospects. Its properties are not yet well understood and hence merit to be studied. This project experimentally investigates and reports on some important issues of pen and touch input on horizontal surfaces, including aspects of speed, accuracy and coordination. The vast majority of web pages adapt very poorly to large displays, especially widescreens. We propose techniques to produce and evaluate adaptive web pages using web standards (and especially features of HTML5 and CSS3). We address issues such as multi-column layouts, scale-dependent element selection and positioning, font size, line lengths etc. 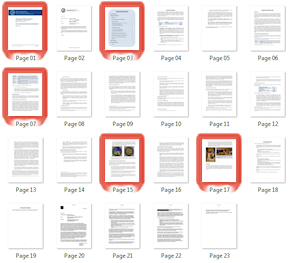 This technique attempts to automatically select a given number of pages from a document that visually "stand out" with a view to including them in a document list with thumbnails of sample pages (e.g. a catalogue or an online book store). 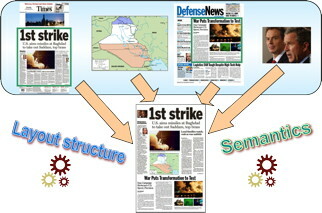 The algorithm considers a set of low-level features such as element block sizes and tone saliency to determine pages that are more likely to attract attention. A smoothing function is available to inject some level of spread in the culling process. This system tackles the problem of finding online content based on paper documents through an intuitive touchscreen interface designed for modern scanners and multifunction printers. 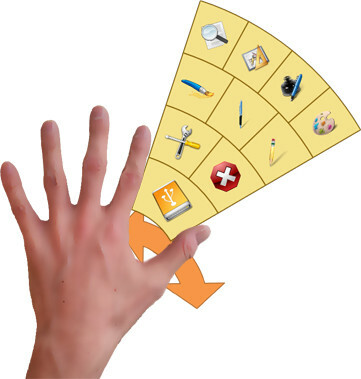 Touch Scan-n-Search allows the user to select elements of a scanned document (e.g. 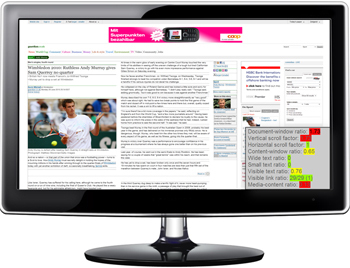 a newspaper article) and seamlessly connect to common web search services in order to retrieve the online version of the document along with related content. This is achieved by automatically extracting keyphrases from text elements in the document (obtained by OCR) and creating tappable GUI widgets to allow the user to control and fine-tune the search requests. SmartPublisher is a powerful, all-in-one application for pen-based devices with which users can quickly and intuitively create new documents by reusing individual image and text elements acquired from analogue and/or digital documents. The application is especially targeted at scanning devices with touch screen operating panels or tablet PCs connected to them (e.g. modern multifunction printers with large touch screen displays), as one of its main purposes is reuse of material obtained from scanned paper documents. This system allows the user to draw rough frames with a stylus or use a scanned drawing to create placeholders for content to be inserted in (e.g. photos for a photo album). 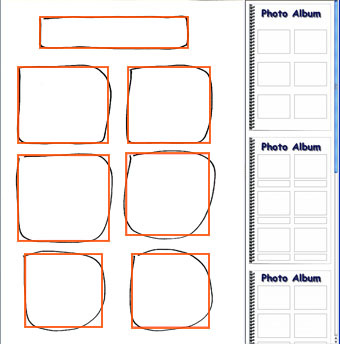 Based on the hand-drawn shapes, queries to search for matching templates can also be issued. The user can then select an appropriate template and automatically map content to its placeholders. This application designed for pen-operated multifunction printers integrates 2 modules that support users to send and share elements of scanned documents. The advanced scan2E-Mail function allows users to send only the desired portion of the scanned document as well as extracted text directly in the E-Mail body. The size and compression level of the sent content can also be adapted to the target recipient device (e.g. a mobile phone). The second module gives users the possibility to gather and send document elements to their work PC. The contents appear in a sidebar from which they can be dragged and dropped into desktop applications such as a word processor. 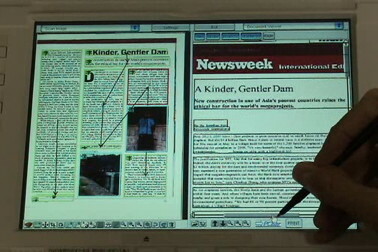 Attempting to print a web page with embedded multimedia content with a standard web browser will at best return a printout with a single frame in lieu of the video. 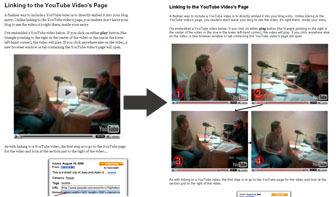 This technique, meant as a browser plugin, extracts a number of relevant frames to be included in the printout to recover some of the lost context of the video. The result is a document containing strips of representative movie frames at the location of the video or at the end of the document. 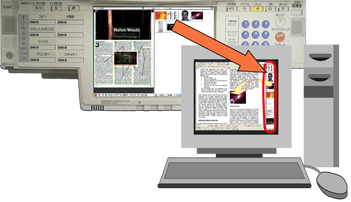 Interactive Animated Document Icons or IADIs are full documents rendered in thumbnail size to be integrated in document lists or file browsers. Pages of an IADI can be "turned" following a user-defined trigger (mouse hover, wheel or keyboard). A magnifying function is also available to zoom the pages for quick previews. The goal of this project is to provide a comprehensive solution to gather and aggregate content relevant to the user from heterogeneous sources (e.g. news articles about a particular topic) and compile the elements into a single coherent document with an appropriate layout. Several criteria are considered to define the constraints used to produce the layout: user preferences, target medium constraints, aesthetic layout rules and semantic similarity between items. This work deals with the extraction of document components from existing office documents in order to populate a database of reusable elements. Those elements can then be retrieved via an ad hoc web interface (using keywords, but also content-based searching) and inserted into new documents. This is a simple shape recogniser in Java that was quickly cobbled up for the purpose of a project. What it does is it recognises and fits basic geometric shapes from a set of points (obtained from a user-drawn sketch, for instance). The recognition algorithm is based on Jorge and Fonseca's GREC '99 paper "A Simple Approach to Recognise Geometric Shapes Interactively". You can test the program in the applet below. Use your pointing device to draw a shape outline on the panel (you can use multiple strokes) and click the "Recognise Shape" button. Supported shapes are Line, Triangle, Square, Rectangle, Diamond, Circle and Ellipse. If no known shape can be detected, a Douglas-Peucker line simplification is performed. Obviously, you need (activated) Java to run the applet. Jar file with source code and external libraries to be downloaded separately (you need CompGeom and Jama). I've put some effort to create a bit of documentation and an example class to show how the recogniser can be used. As for all free experimental programs you get from the Internet, the usual disclaimers regarding performance, robustness, functionality etc. apply. The code is provided as is, and you're more than welcome to improve it, if you find it doesn't suit your needs.